NOW AVAILABLE in the Palm App catalog! Download it today for $.99! Tea Pal is a tea lovers best friend. 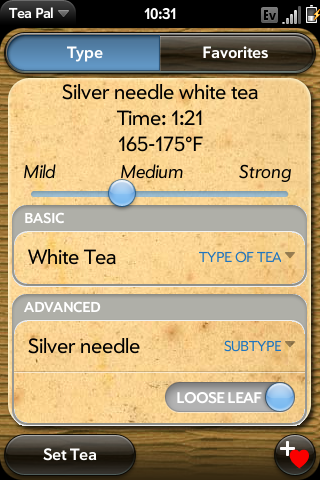 It is a simple application that will help you brew a better cup of tea for less then the price of one at Starbucks. First of all, it has a simple yet effective tea timer. You can manually set any time you want, to the second, or you can set it interactively by the tea you’re about to brew. The timer also includes a reset button to make multiple infusions easier. Not only does it keep track of the time, it also will help you keep track of the temperature you should brew at and the ratio of tea to water. 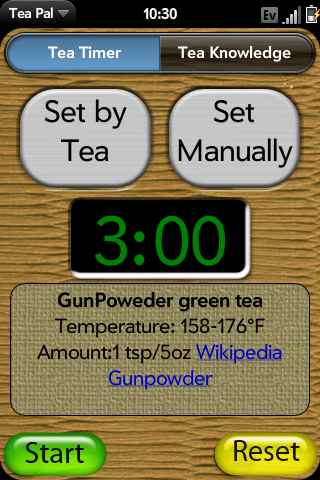 Tea Pal additionally lets you save your favorite teas, times, and temperatures for quick timer setting. 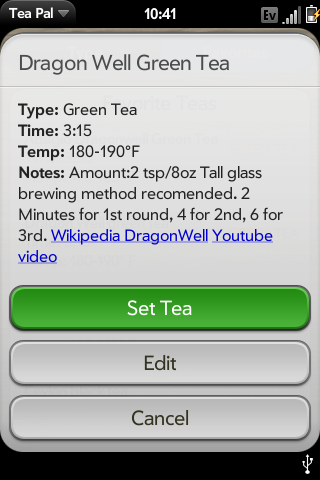 Tea Pal can also keep notes on each of your favorites, to help yourself brew that perfect infusion next time. 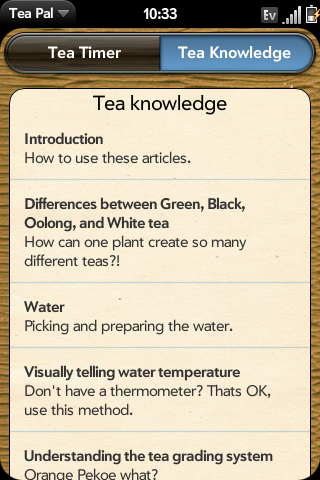 Besides the timer, Tea Pal includes a tea knowledge section. Full of how to’s, history, and information about tea, it will give you something to read and look at while you wait for your tea to get done. Currently it includes 17+ articles and many interesting links, but I will continue to add more with each free update to the program. 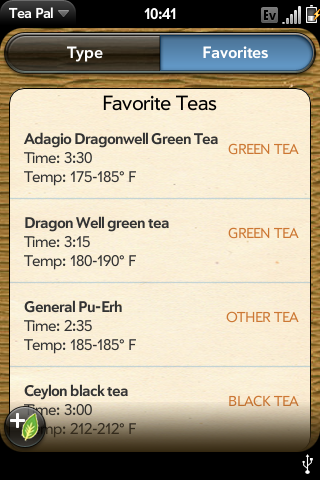 Tea Pal will also let you pick your own alert sound, and choose between Celsius or Fahrenheit for temperatures. I am also very active in fixing bugs or adding features, so please contact me if you have any problems or think of a feature you would like. 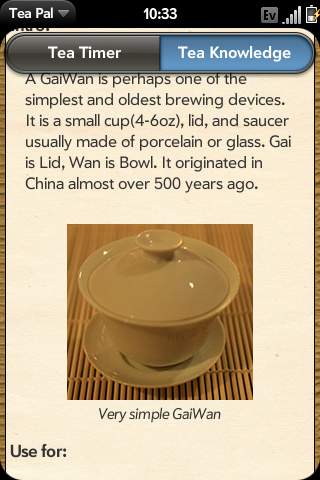 Looking at a favorite tea, one of the presets from the interactive picker in fact.